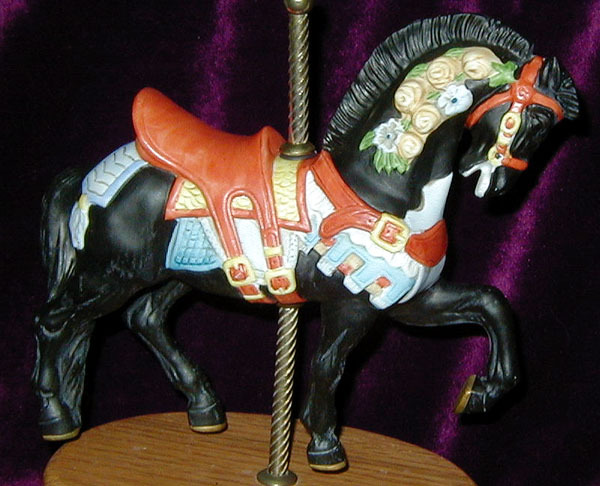 A copy of a Stein and Goldstein horse. This piece came with different base configurations, most commonly with an oval brass base though other combinations (such as a rocking-horse base) were also produced. The piece is about 7-8" to the top of the pole. There is usually no coin set into the bases of these. The music box (if it has one) almost always plays "The Carousel Waltz".